Axe Gold Oud Wood and Dark Vanilla Deodorant, the men's deodorant stick that keeps you feeling GOLD all day with a sophisticated fragrance. All that to protect your style. Impeccably. The finest fragrance ingredients in a men's antiperspirant stick in a rare combination that exudes sophistication and stands out from the rest. To catch attention and arouse curiosity. 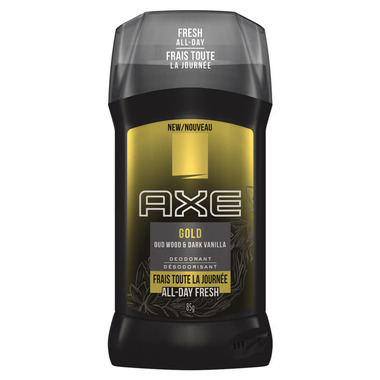 Axe Gold Deodorant Stick for Men goes on smoothly for all day odour protection. Just a few quick swipes in the morning and you're feeling fresh and dry all day. Keeps your style in check so you can focus on looking good and turning heads. To refine your style even more get showered with Axe Gold Body Wash for men and try Axe GOLD Body Spray with Oud Wood & Dark Vanilla scent, the new body spray deodorant for men. Find Your Magic with Axe Gold with Axe Gold Antiperspirant for Men 76g from Axe Grooming For Men.